Here I am with my beautiful children enjoying delicious snacks at a café. We worked off those snacks with games of tag in the park and then a long and steep walk through one of our favorite neighborhoods. 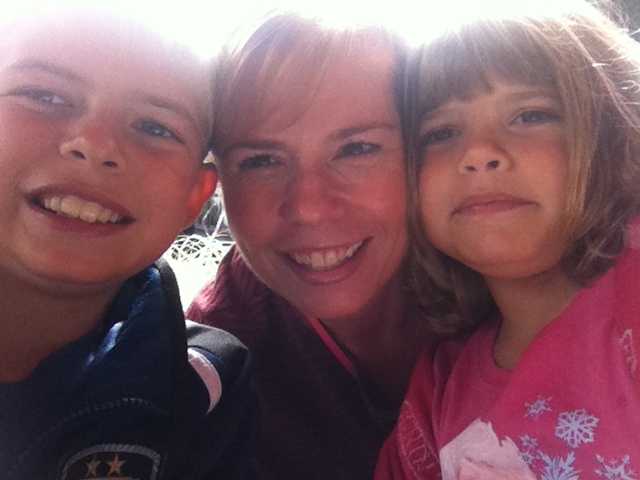 This defines my weight loss success more than losing 100 pounds — a day of fun with my kids! Yes, I have officially lost 100 pounds! Technically it’s 100.5 pounds in 1 year, 1 month and 11 days. First, let’s get over the part of me being a little sad about this fact. There is a little voice in my head that tries to negate my success by saying “It’s pathetic you had to lose over 100 pounds to begin with!” Yes, I am telling this voice to take a hike. I’ve always believed that regret isn’t worth the trouble. What has happened has happened and hopefully I learn from my earlier choices and don’t repeat the bad ones. And if I do repeat them, I just try harder not to in the future. With this negativity pushed away, let’s talk about success! I am a goal-oriented gal so finally hitting my goal of 100 pounds makes me happy and proud. It feels amazing to have met this goal, but it’s not the highlight of my journey like I thought it would be. As I talked about in my last blog, “The Scale is Not the Be-All and End-All in Weight Loss”, the scale isn’t my biggest measure of success. The way I feel these days was really what I was looking for when I finally committed to losing weight. Being 100 pounds lighter reflects not only my new body shape and health, but also the more positive outlook I have on myself and my life. Where do I go from here? I still have my goal of losing another 11.5 pounds to make my goal of being healthy according to the BMI chart. I am still working toward it, but I am not pressuring myself. Sure I’d like to lose this weight, but I am more concerned about maintaining my current weight. All the yo-yo dieting I did over the past 30 years has to stop. I want to treat my body with more respect now. Considering all the damage I’ve done to it, my body has been there for me and given me two amazingly beautiful children. It’s time to pay my body back with eating well and exercising as part of my life and not just as a dieting phase. Mentally I still struggle with my weight, but when I think about over-eating or making poor choices, I get myself to stop and think about how much better I feel now. I am happier. I am healthier. I can do so much more than I imagined I could. Losing weight is giving me a whole other outlook on life and what I can accomplish. I will always battle the “fat chick” inside of me, but I feel more ready to handle her than I did 100 pounds ago. So, yes, I will celebrate my weight loss of 100.5 pounds! I am celebrating it every day with the life I now lead with my ever-supportive husband and sweet children. I also celebrate it with my family and friends who have supported me along the way. I am glad that I am sharing my gastric sleeve journey. Going Down the Scale with love and encouragement is one of the best rewards! Yes, I realize for a blog called “Down the Scale”, naming a post that downplays the scale’s role in a weight loss journey might seem strange. Now that I’m a year past my gastric sleeve surgery, I realize that success is more than a number on the scale. There are so many other ways to measure my success and I need these other kinds of measurements to keep me inspired. 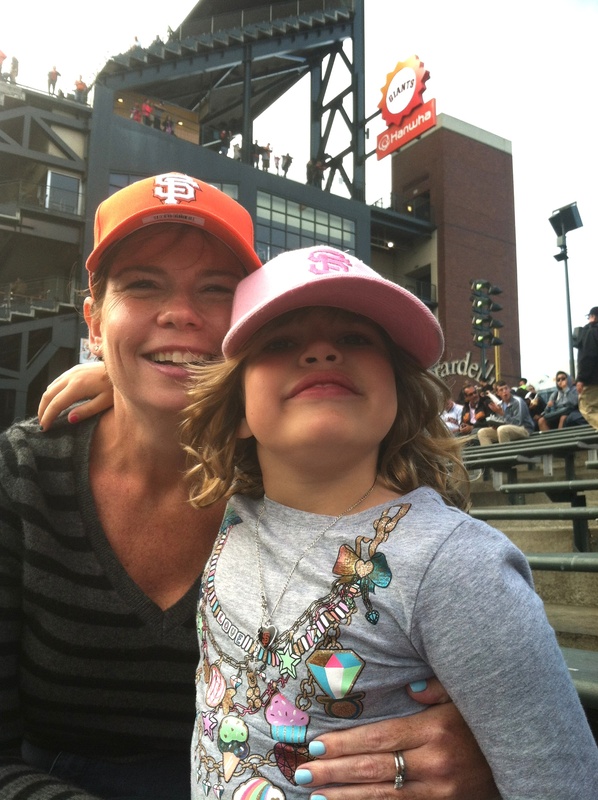 My daughter and I enjoying her first Giants game! I was thrilled that I only took up my designated spot on the bleachers instead of spilling over into my daughter’s seat. Losing 96.5 pounds is rewarding in so many ways! I’m not saying that the scale isn’t important in my life because I will always need it. It keeps me on track and since it is showing me a 96.5 pound weight loss now, I love my scale. Here’s the but…I wish it showed a 100 pound weight loss. I really like the idea of a three digit total loss. I also would ideally like to lose another 15 pounds. When the scale doesn’t show me what I want to see, it’s easy to get frustrated and depressed. How do I keep from get frustrated and depressed? Fortunately I’ve come up with many ways! First, I went to see the weight loss therapist I met with before I had surgery. I knew I needed help with dealing with my emotions about food (see my blog post “One and a Half Pounds of Physical and Emotional Weight…”). When she confirmed all my feelings post-surgery were normal, right there that made me feel great. Who doesn’t like to know that their emotions are typical and not too crazy? Taking care of myself emotionally with professional help reminds me how far I’ve come since I decided to have surgery. Another important measurement of success is my clothing. I donated all my larger clothes so I can’t go back to wearing them. I used to have at least two different sizes of clothes, so that I would always have something to wear. Even though the scale keeps showing me up and down by two pounds, my clothes still fit well. As long as I stay in my current size, I feel successful with my weight loss. Feeling “normal” was one of my goals when I chose to finally lose weight. I was tired of standing out for being the “fat chick.” At least that’s how I felt when I was out in crowds and especially when I was out with other women. Last week I enjoyed a great night out with friends and this time when I saw a photo of us all together, my first reaction was “What a great photo!” instead of “Oh, I’m the fat one.” A simple change in my attitude means the world to me. My favorite measure of success is my overall feeling of health. Just moving around without the physical and emotional weight of 96.5 pounds still amazes me! Walking, hiking and swimming are some of the fun and healthy activities I’m enjoying this summer. I never thought I would crave being outdoors and being active as much as I do now. And let’s not forget the everyday activities that are easy now! Carrying multiple heavy grocery bags up two flights of stairs isn’t a hardship, but just another part of my day. The mental and physical “lightness” of my life is more than I dreamed of when I committed to changing my life over a year ago. I’m not throwing out my scale, but I am learning not to let it rule my world. Weight loss is more than a number on the scale. It is about feeling good mentally as well as physically. I am thrilled that I am learning to see my accomplishments in more than terms of numbers. Going Down the Scale definitely means so much more in my life now!